The Clean Show in June this year marked another successful exhibition for Pellerin Milnor Corporation, where the company proudly displayed the Milnor PulseFlow™ technology continuous batch washer (CBW®). The eight-module PulseFlow technology tunnel washer attracted a constant flow of traffic to the Milnor booth and was received with great interest and enthusiasm. Milnor also had a skeleton model of the PulseFlow tunnel washer on display, which demonstrated to attendees exactly how Milnor's True Top Transfer technology is the most efficient form of tunnel batch washing. 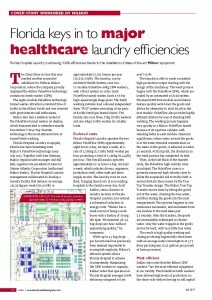 Florida Hospital Laundry in Apopka, Florida has been benefiting from Milnor's PulseFlow technology since July 2013. 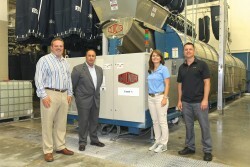 Together with Sam Kielman, Milnor Regional Sales Manager, and Bill Bell, Regional Vice President of Sales for Steiner Atlantic Corporation (authorized Milnor dealer), Florida Hospital Laundry management collaborated to develop a laundry facility that delivers on average 510,000 lb (231,332 kg) or approximately 26,525,000 lb (12,031 tonnes) per year. The laundry, run by Adventist Health System, runs two 12-module PulseFlow 68kg CBW washers, with a third system on order. Each PulseFlow tunnel washer loads a 56 bar high-speed single stage press. The batch washing system loads a shared independent dryer 'POD' system consisting of six pairs of double batch gas heated dryers. The facility also runs three 170 lb (77 kg) washers and one 200 lb (91 kg) washer for smaller loads. Florida Hospital Laundry operates the two Milnor PulseFlow CBWs approximately eight hours a day, six days a week, at a rate of 5,720 lb (2,595 kg) batch washer per hour producing a total of 11,440 lb (5,190 kg) per hour. The overall laundry operates approximately 12-14 hours a day, six days a week, which includes drivers, engineers, production staff, office staff, and linen supply service. The laundry runs its own fleet, bringing linen from 15 surrounding hospitals to the facility every day. Scott Sadlier, Senior Director of Laundry Services at Florida Hospital Laundry, has noticed a substantial reduction in energy costs. "Milnor has a track record or being a workhorse with a history of a long life span. We maintain 38-42 bag drops per hour without jeopardizing quality," he comments. While up to 42 bag drops per hour/tunnel has previously been deemed impossible to accomplish regularly, Milnor's efficient system allows Florida Hospital to achieve it consistently. Maximizing the CBW washers to capacity, Sadlier notes that operation at Florida Hospital averages 106% efficiency compared to last year's 92%. The laundry is able to reach consistent high production output starting with the design of the machinery. 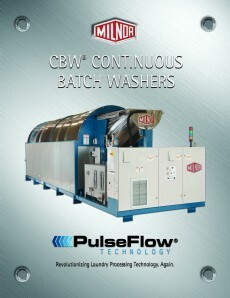 The wash process begins with the PulseFlow CBWs, which are loaded by an automated soil rail system. The RecircONE® first module recirculation feature quickly wets down the goods and allows for chemistry to start its job in the first module. PulseFlow also provides highly efficient dilution by way of standing bath washing. The washing process happens very quickly in a Milnor PulseFlow tunnel because of its spacious cylinder with standing baths in each module. Chemical equilibrium, where water around the goods is at the same chemical concentration as the water in the goods, is achieved in under 40 seconds. At that point, the chemistry in the wash process has completed its task. Then, in the last third of the transfer cycle, the PulseFlow high velocity rinse is initiated. The PulseFlow rinse is a precisely measured high velocity rinse to dilute the suspended soil from the bath. A second dilution then ensues by the True Top Transfer design. The Milnor True Top Transfer moves linen by lifting the goods out of the water, draining the free water, and then sliding the goods into the next compartment. This process happens in one continuous movement, and movement from one module to the next takes just 3.5 seconds. After the transfer, the goods are immediately submerged in cleaner water. Only the water trapped in the goods moves forward, with very little free water. The result is high quality washing and rinsing producing hygienically clean linen with an average water consumption of 0.45 gallons per pound (3.75 liters per kilogram) of linen processed. Sadlier also notes that the Milnor CBW washers "are the most efficient equipment in our facility. The PulseFlow batch washers have allowed high levels of production on the clean-side without having to add capital to maintain customer demands." Each batch washer then discharges to a 56 bar single stage press. The presses are designed with rapid flow hydraulic pumps so goods can be pressed longer under maximum pressure. To add more time under pressure, a safety rated light curtain was mounted on the discharge-end of the press that eliminates wasteful time for a mechanical door to raise as the goods are transferring from the press. Milnor has also created a continuous workflow by integrating automated sling systems to transport linen between machines throughout the laundry process. There are no shuttles in Florida Hospital, which eliminates gates areas and cart congestion. After extraction, the impressive press-to-dryer rail system automatically carries two washed loads overhead in one bag to the next available storage belt between any of the six pairs of Milnor dryers. After a load has been dried, the dryer discharges the linen onto a belt that takes the load to a clean-side rail system, which is waiting to transport the load to its next destination. As soon as the dryer discharge door closes, the load door opens allowing the linen waiting on the belt to load within seconds. This optimizes dryer efficiency. Florida Hospital is also equipped with touchscreen controls throughout the facility. All batches are tracked as they progress through the machines, and all data is saved. Additionally, the tunnels' Mentor® controls have been embedded with a video of the load chute for the respective CBW, while the MultiTrac™ control has camera feeds to all photo-eye sensors on the discharge conveyors. The laundry also utilizes the highly efficient Chicago Dryer finishing equipment, which complements the PulseFlow technology seamlessly. Sadlier says, "Just as important as the equipment, it is important that the sales representative understands business needs and what management is looking for. Bill Bell with Steiner Atlantic Corporation has always been a great partner and continues to understand what the needs of our business are today as well as what our future needs will be." For more information on Pellerin Milnor Corporation, tunnel washers, or authorized dealers, please visit www.milnor.com or call (504) 467-9591.